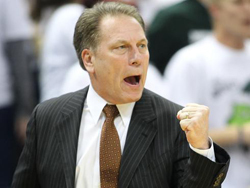 Coach Tom Izzo is ready once again to lead the Spartan Men into Battle. The question is - are you ready? Hey sports fans! Now while the Michigan State Football team is still red hot and driving with full force towards its goal of another Big Ten Championship and potential National Championship berth, we have something else to be excited about as Spartan fans. That of course is the return of Spartan Basketball! You got it. Coaches Tom Izzo and Suzie Merchant are back, rested and ready to lead their respective teams into another memorable season of glorious green and white hoops! Of course you&apos;ve most likely seen by now Coach Izzo&apos;s awesome tribute to rock band KISS at the recent Midnight Madness event and thats just a small sample of what Izzo is willing to do to entertain, thrill and rally support for the Spartan Nation. If the kickoff event was that exciting, what might the season itself hold? Wisconsin is picked to win the Big Ten, with the Spartans in striking distance, but I like our chances to topple the Badgers. From returning players to new and talented players the Spartan teams are sure to make some noise in the regular season and make a deep tournament run as well. Why not, right? It&apos;s become a tradition around here! The season kicks off in earnest on Monday at the Breslin Center as the Spartans take on The Masters College in an exhibition game. Start the season off right and come down to the game and scream your head off! You see football rolling AND the return of basketball makes the Greater Lansing area, and the campus of Michigan State, even more awesome than usual. That means its the perfect time for a visit. Catch the game, buy a t-shirt, grab a bite - you get it. If you love Spartan athletics, you&apos;re loving life right now, come be a part of the action.